Whether the cause is tooth decay, gum disease—#1 on the list of reasons, with 50% of Americans over the age of 30 having the most severe form of periodontitis—illness, or injury, there are solutions. Dr. Etchison, Dr. Pycinska, and Dr. Eberhardt at Nelson Ridge Family Dental would like to fill you in on your options, which have expanded and improved over the years thanks to technological advancements and continuing education. You’re probably familiar with the cliché, but in case you’re not, the ending goes: “is worth a pound of cure.” At Nelson Ridge Family Dental, we believe this to be true. We hope to see smiles from all over New Lenox regularly so we can catch problems in their earlier stages and help you avoid the need for more extensive procedures. If tooth decay and/or infection within your tooth’s pulp chamber is caught in time, we might be able to salvage your tooth with a root canal, inlay or onlay, or a crown. If you’ve got a separation between two or more teeth, a little bit of relationship counseling might be helpful… kidding! What Dr. Etchison, Dr. Pycinska, and Dr. Eberhardt can do is design a dental bridge to restore your smile’s function and beauty. If all or most of your teeth require replacement, dentures are another option—one that has expanded and improved over time. Dr. Etchison, Dr. Pycinska, and Dr. Eberhardt can help New Lenox residents choose which type is best for their case, between conventional, immediate, and overdentures. Going the conventional route means allowing for a healing period before they’re fitted, which can take several months. Immediate dentures can be placed after remaining teeth have been extracted, thanks to measurements being taken and models being created of your mouth and jaw during a preliminary visit. Overdentures are a great option if you have healthy teeth remaining, as they can fit over the top of your tooth roots along with implants, which gives them a more natural feel and appearance. You may experience discomfort during your adjustment period, but we will do all we can to ensure your oral health and function return. 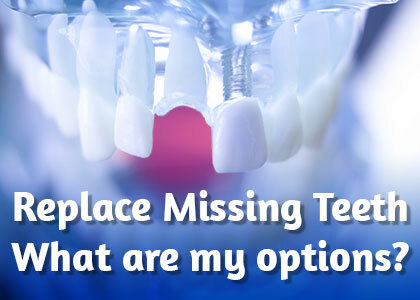 The jury is not out when it comes to replacing missing teeth. It’s important not just because the hole they leave can hurt your self-confidence—it can also hurt your oral health. Surrounding teeth may shift and alter your bite, and without that root, your jawbone starts to deteriorate, causing a sunken-in facial appearance. If you’ve been missing one or more teeth for a while, you know it also impacts your diet and the way you speak. Dr. Etchison, Dr. Pycinska, and Dr. Eberhardt are able and would be honored to restore your smile to the healthy, beautiful state you deserve. Contact Nelson Ridge Family Dental today to make an appointment!